Put off by snarled city traffic and a shortage of parking, more Indians are shopping for groceries online, helping e-tailers like Bigbasket and Localbanya turn in profits while supermarkets are struggling. The online grocers benefit from low overheads, as they store goods in warehouses outside big cities where commercial rents are sky-high. Some like Bigbasket can also charge more for certain items than traditional supermarkets, which means even more profits in a country where all food retailers enjoy margins as high as 20 per cent on rice and other staples. Bigbasket director Ganesh Krishnan said the company would turn a profit this year, just three years after it was set up. 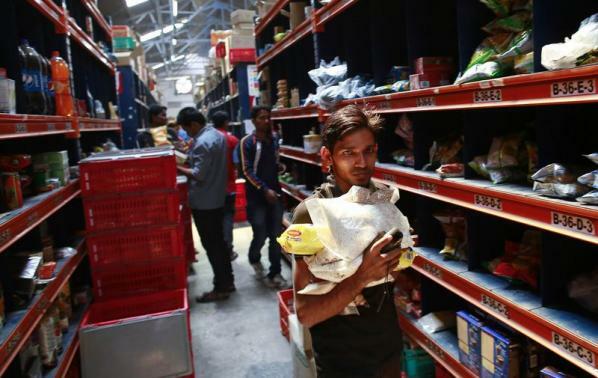 By contrast, analysts say supermarkets like More, owned by the Aditya Birla Group, and Reliance Industries Ltd's Reliance Fresh are struggling to attract enough customers to make a profit as they compete with the small neighbourhood stores where most people buy food. Both conglomerates declined to give figures for their supermarket operations. "You can go shop at a Walmart or Tesco in the US and UK and they have parking. You can take the shopping carts right up to your car, so it's smooth," Krishnan told Reuters. "In India, none of this exists." Densely populated cities have proved attractive for web grocers in Asia. Analysts estimate online sales of fresh produce in China could quadruple to 40 billion yuan ($6.5 billion) in five years from about 11.5 billion yuan in 2013. Overall, e-commerce is rapidly growing in India, fuelled by an expanding middle class and better web access, and the potential for online grocers in particular is huge. Most food shopping in India is done in cramped groceries that offer limited variety. Urbanites also frequent supermarkets, but e-grocers are becoming more popular as more shoppers are willing to pay extra for the convenience of not dealing with traffic and parking problems. Sales of food and groceries currently account for more than two-thirds of all retail sales, consultants Technopak say, and the value of these sales is expected to nearly double to $686 billion by 2020. Investors are taking note. In September, Helion Ventures and Zodius Capital led a funding round that raised Rs 200 crore of Rs 2 billion ($32.6 million) for Bigbasket. Rival Localbanya is also looking to raise a similar amount to expand nationwide, its co-founder Amit Bhartiya said. By running their own delivery networks, and warehousing outside the city, e-grocers are better able to control costs: analysts say the operating costs of traditional supermarkets are higher when you factor in rent and utility bills, for example. Bigbasket, which started out in December 2011, currently has about 220,000 active customers Mumbai, Bangalore and Hyderabad. It plans to launch in Pune, Delhi and Chennai in the next three months, highlighting just how quickly online grocers can grow compared to traditional supermarket chains. "Where brick and mortar grocery in India fails to muster scale, online can do it very, very quickly just by the sheer opportunity of reaching a number of people with much less investment," said Harminder Sahni, managing director of consultants Wazir Advisors.